Walter is extremely slow moving, but he puts his nose to the ground and wanders. So we need to fence our backyard. Thankfully, our backyard is already fenced on three sides thanks to our neighbors. All that is required is to close it off. In the picture below, you can see how our house is positioned on our lot. 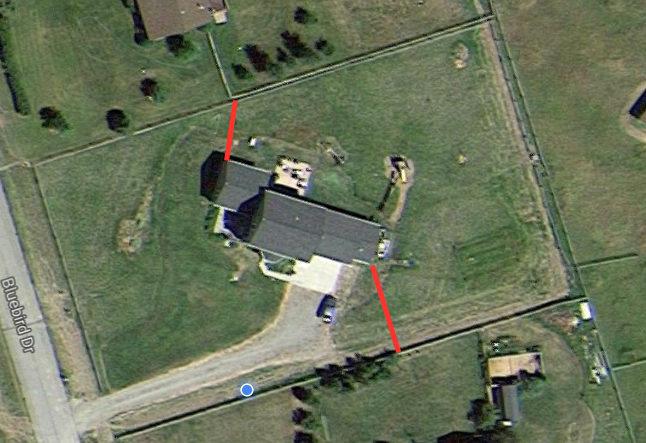 The red lines are the sections of fence that we will add. The fence design will be 6" round posts pounded in to the ground, a 2x4" mesh woven wire stretched across the posts, and some flat rails added to dress it up a bit. This past week we had a fencing company come and pound posts in for us. It took them about three hours to sink in 14 or so posts. The recommendation fro them was the pounding these things straight into the ground is a lot stronger than digger and setting in concrete. - 12 foot gate on the south side for the camper, boat, and any other large vehicle or equipment we need to get through to the back yard. We also purchased the lumber to do the rails. Up next is to stain the posts, install the cap boards between the posts, stretch the wire, and install the gates. Excellent conversation, great style function, good supplies and efficient documents. Good pricing. The function crew had the tube break however the company covered all of the costs associated with the actual repair. Would suggest them check this out.